Holy smokes, Eliud Kipchoge (Kenya) ran 2:01:39 to set a new marathon world record at the Berlin Marathon. That’s not our normal opener, but a world record of that magnitude is pretty amazing. 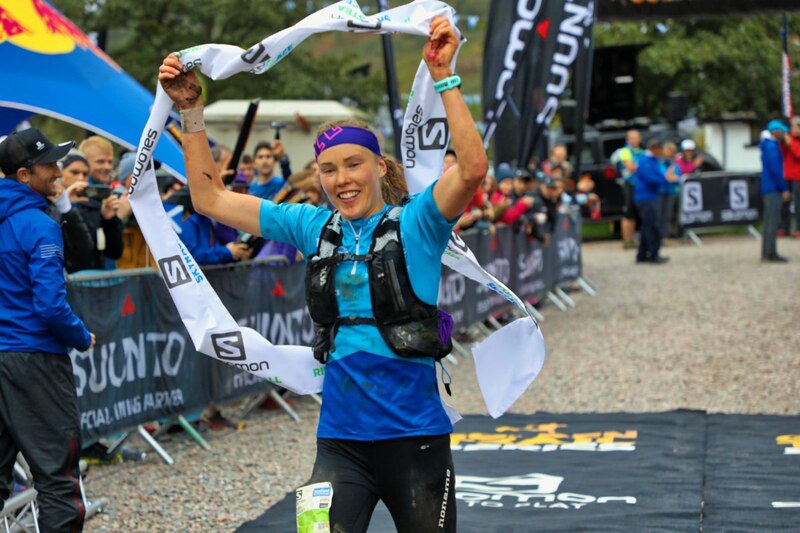 Moving right along, this week’s column is jam packed, again, thanks to the World Mountain Running Championships, the Run Rabbit Run 100 Mile, and the Salomon Skyline Scotland series of races. Let’s do Monday right! The 34th World Mountain Running Championships happened in mountainous Andorra on an uphill 12k course with 1,000 meters of elevation gain. 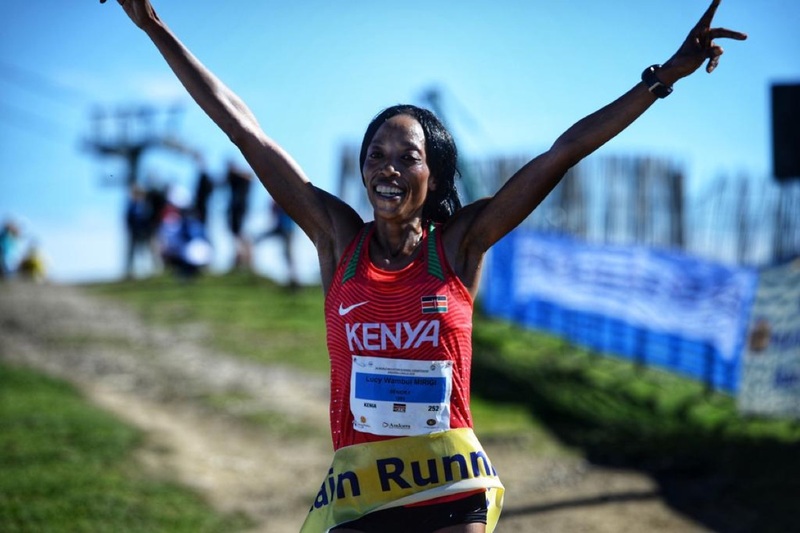 Up and down, or just up, it doesn’t matter, Lucy Wambui Murigi (Kenya) earned a repeat win. That’s right, she won last year’s up-and-down race and came back to win this year’s all-uphill run. Murigi won each of the last two Sierre-Zinal races too. Her 1:04:55 finish brought her to the line 65 seconds ahead of Maude Mathys (Switzerland). Murigi’s teammate Viola Jelagat was third in 1:06:26. Andrea Mayr (Austria) had won every biennial uphill championships for over a decade, but finished just sixth in 1:07:37 this year. The third-scoring Kenyan runner placed 13th, helping Kenya to team gold with a perfect score. The U.K., with two runners inside the top 10–Emily Collinge at seventh and Sarah Tunstall in 10th–finished as the second team, and France earned team bronze. The U.S. finished fifth. Annie Bersagel, making her first worlds appearance, was 17th in 1:11:58. Only a couple of weeks away from the Leadville Trail 100 Mile, Addie Bracy was still 20th, and Allie McLaughlin and Kasie Enman were 26th and 27th, respectively. 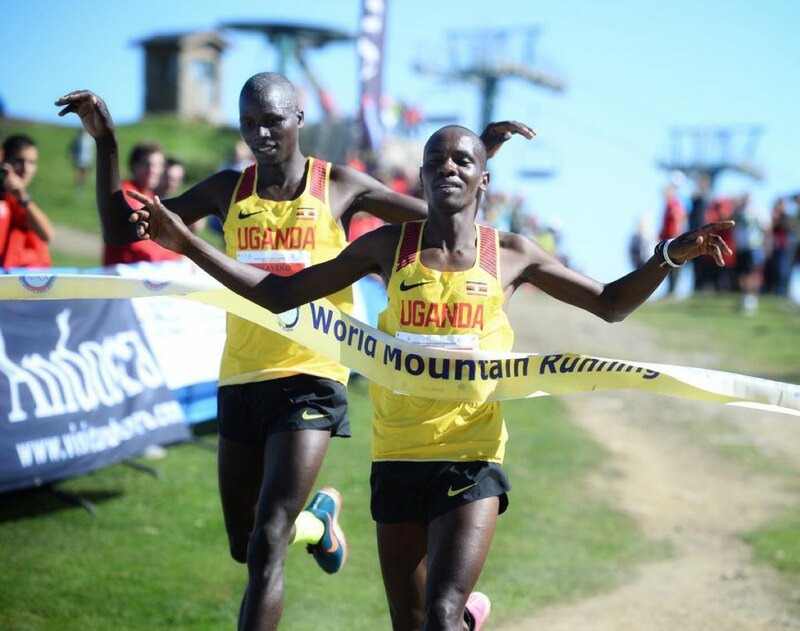 Uganda only had three men racing, but that’s all it took to win team gold. Robert Chemonges, Joel Ayeko, and Victor Kiplangat went one-two-three in 55:37, 55:38, and 55:54. The country has dominated the men’s race for the better part of the last decade. Joe Gray (USA) was fourth in 57:08, and Italy placed Francesco Puppi, Martin Dematteis, and Bernard Matteis seventh, eighth, and ninth, respectively. That depth gave Italy team silver, and Norway, led by Johan Bugge in fifth, was the third-place team. The U.S. men finished the team competition sixth. Andy Wacker was 26th, David Fuentes was 32nd, and Matt Daniels placed 44th. On a 7k course in the junior race, Risper Chebet (Uganda) won the girl’s division in 41:19, and Uganda again won team gold. The U.S. girl’s team was sixth, led by 14th-place Anna Shults in 47:15. The boy’s race too was led by Uganda, both individually and as a team. Just like in the senior men’s race, they placed their runners one-two-three at the front. Of that trio, Dan Chebet was first in 35:49. The U.S. finished seventh here with Soren Knudsen the top finisher at 27th. Of the four team races then, Uganda won three with the senior women’s team race their lone blemish. They did not field a full team in that race, though Patricia Chepkwemoi placed fourth individually. Also interestingly, although Uganda has found widespread success in this competition, neighboring Kenya has not. Their senior men’s team was just ninth with their top runner finishing 14th. Next year’s World Mountain Running Championships and World Mountain Running Long Distance Championships will be held in November of 2019 in Argentina. After the Comrades Marathon, the seventh-annual Run Rabbit Run 100 Mile is the second-richest ultra in the world. $13,500 went to each of the men’s and women’s winners, and a total $65,000 in cash money was up for grabs. Michele Yates won this race back in 2013 and was that year’s UltraRunning Magazine (North American) Ultrarunner of the Year. She’s had a baby since then and endured career-threatening injuries, while still competing in shorter-distance and less-competitive races, and racing mountain bikes too. And then there’s the point that she dropped from this race each of the last three years. Yates’s unlikely comeback though culminated with an emphatic 22:33 win. Official results have yet to post, but Emma Roca (Spain) was second, Kerrie Bruxvoort third, Sarah Pizzo fourth, and Meredith Edwards fifth. Jason Schlarb won this race in 2015 and, just like women’s winner Yates, in 2013 too. He won the race for a record third time in 2018, finishing in 18:48. On a very hot day, he overcame quad issues early in the race that had him back in fifth place before rallying. Mark Hammond was second and Jeff Browning, finishing 100 miles for the third time this summer, was third. Kyle Pietari was fourth. The Salomon Skyline Scotland series of races happened over four days, much of it in bad weather. The first three races were all Skyrunning World Championships, but we’ll report all four races in time order. Up first, Thursday’s Mamores VK went 5k and 1,000 meters to the top of 1,056-meter Na Gruagaichean, a peak in the Mamores mountain range. VK ace Laura Orgué (Spain) topped out first in 51:35, bettering her own course record by two minutes. Lina El Kott (Sweden), one of this year’s breakout stars, was second in 52:34, and Hillary Gerardi (USA) was third in 52:53. Just like Orgué, men’s winner Rémi Bonnet (Switzerland) has also made a name for himself first in Vertical Ks. He won this one in 39:23. Norway’s Thorbjørn Ludvigsen and Stian Angermund-Vik were second and third in 41:49 and 41:50. Weather kept the traditional course from being run and so racers didn’t touch the country’s high point, 1,345-meter (4,413-foot) Ben Nevis. The revised Friday course ran much faster over 47k and with 1,750 meters of gain. Although only 5k shorter than the official route, the re-route had less than half of the elevation gain intended. Ragna Debats (Netherlands) was relatively unchallenged here, winning in 4:36. Gemma Arenas (Spain) and Mercedes Pila (Ecuador) kicked for runner-up honors, with Arenas running 4:50:32 and a four-second lead. Men’s winner Jonathan Albon (U.K.) similarly got away from the chase pack by a surprising margin. He won in 3:48, and was next followed by André Jonsson (Sweden) and Luis Alberto Hernando (Spain). Jonsson was second in 4:00, less than a minute in front of Hernando. 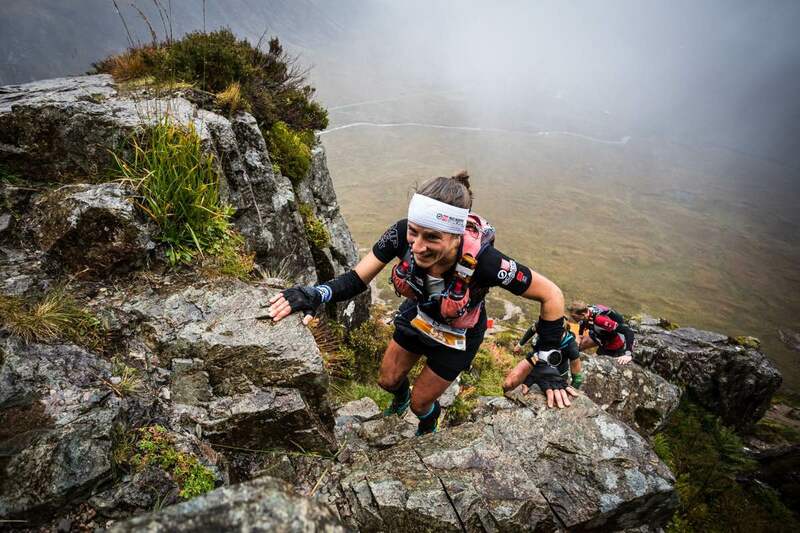 The 29k Ring of Steall Skyrace gained 2,500 meters of elevation, and was the fifth race of the Golden Trail Series. It was the most technical of the Golden Trail Series races with some scrambling required, and was the last of the weekend’s Skyrunning World Championship races. iRunFar was there with live coverage and has separately recapped how the Saturday race unfolded. World-class orienteer Tove Alexandersson (Sweden) surprised the women’s field with a first-place 3:46. It was some 20 minutes better than the previous course record, and she was the first of six women on the day to run under the previous record. U.K. runners Victoria Wilkinson and Holly Page were second and third in 3:54 and 3:57. Emily Schmitz was the first U.S. finisher in 4:34 for 19th. Best ever. 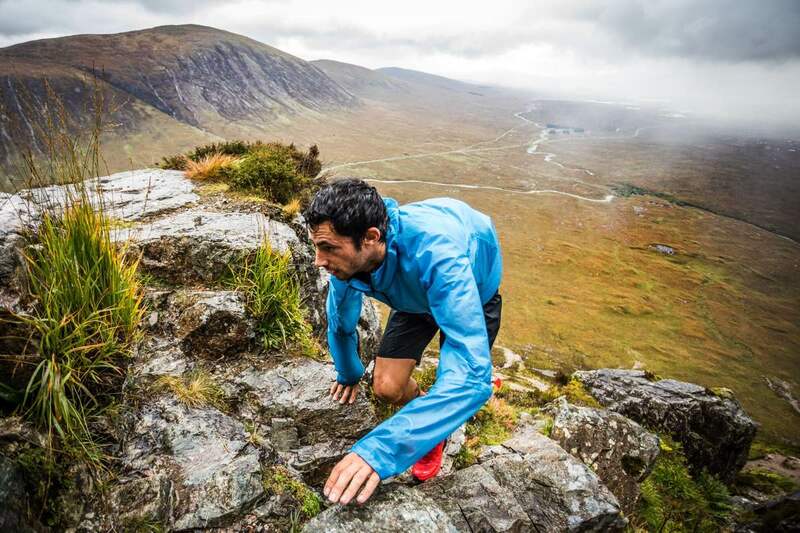 Overlook the UTMB drop and Kilian Jornet (Spain) has had a year for the record books. He’s won a lot of races this year, everything he’s lined up for but UTMB! Just like the women’s winner, he too was 20 minutes better than the old course record here and won in 3:04. Nadir Maguet (Italy) was a surprise second in 3:06, and defending champ Stian Angermund-Vik was third in 3:09. For the U.S., Sage Canaday was 18th in 3:31. The race was the final chance for runners to earn points to qualify for the Golden Trail Series finale, the Otter Trail African Run on October 20 in South Africa. Women qualifiers include Ruth Croft (New Zealand), Ida Nilsson (Sweden), Laura Orgué, Megan Kimmel (USA), Eli Gordón (Spain), Holly Page, Sheila Avilés (Spain), Silvia Rampazzo (Italy), Fanny Borgström (Sweden), and Megan Mackenzie (South Africa). Men’s qualifiers are Kilian Jornet, Stian Angermund-Vik, Marc Lauenstein (Switzerland), Aritz Egea (Spain), Oriol Cardona (Spain), Stephan Wenk (Switzerland), Alexis Sévennec (France), Sage Canaday, Thibaut Baronian (France), and Bartłomiej Przedwojewski (Poland). The four-race weekend concluded with the Glen Coe Skyline on Sunday. Though not a Skyrunning World Championship race, this one was part of the Skyrunner World Series and was the most technical of the weekend’s races, and it got the worst weather too. The race was reduced to 32k with 2,700 meters (8,858 feet) of elevation gain, though still included some class-three scrambling. Hillary Gerardi and Jasmin Paris (U.K.) turned down the chance to tie and sprinted it out for the last 200 meters. Gerardi, doubling back from the earlier VK, finished in front by seven seconds at 4:17. The two battled all day with Gerardi excelling on the ups, and Paris the downs. Brittany Peterson (USA) was third in 4:25. And then doubling back from the day prior’s 29k, Kilian Jornet won again, this time in 3:37. André Jonsson, himself returning from Friday’s Ben Nevis Ultra, was second in 3:40. The two finished first and second here in 2017 also. Daniel Jung (Italy) was third in 3:42. For the U.S., Cody Lind ran 3:45 to finish fifth. The next Skyrunner World Series race is the September 29 Ultra Pirineu in Spain. The latest The North Face Endurance Challenge Series installment went to Wisconsin. Jessica Bird won a close 50k in 4:41, only 31 seconds ahead of second-place Allison Palmer. Nick Arndt won the men’s 50k in 3:42. Over 50 miles, Kelly Donoghue and Jon Petykowski were victorious in 8:31 and 7:12. Full results. The third and final Under Armour Mountain Running Series race of the year went to Bend, Oregon. Official results have yet to post, but Tara Richardson pocketed $1,500 in winning the women’s 50k, and Ryan Bak won the men’s race. Full results (when available). Amy Phillips and Adam Kimble won the 68.5-mile Folsom Lake Ultra Trail near Auburn, California. The two went for 13:21 and 10:59 runs. Full results. Tor des Géants goes 353k (219 miles) with massive elevation gain through the Italian Alps. It was underway last weekend, and early this past week Silvia Trigueros (Spain) won the women’s race in 87:50. Men’s winner Franco Collè (Italy) finished in 74:03. U.S. runners Matthew Smith, Luke Nelson, and Avery Collins finished seventh, eighth, and 11th in 85:14, 85:22, and 86:59, respectively. Full results. In Idaho, the IMTUF 100 Mile took place. Results are not yet posted but we hear Olga Nevtrinos won for the women and David Ayala for the men. Full results (when available). The NorthCoast 24 Hour Endurance Run is the USATF 24-Hour National Championships. Top women’s entrants include Megan Alvarado, Jasmine Chiaramonte, Traci Falbo, and Charlotte Vasarhelyi. Men’s lead entrants include Israel Archuleta, Ronnie Delzer, Joe Fejes, David Johnston, Olivier Leblond, Harvey Lewis, Steve Speirs, and Adrian Stanciu. We’re pretty used to this exercise now, and you are too! Let’s get your thoughts and friendly additions in the comments section. Every week I read this column I mean to comment so I’ll do it now before I put it off for another week. 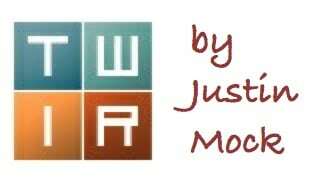 I LOVE TWIR! The results, the witty and concise writing style… It really gets my week of to a great start. 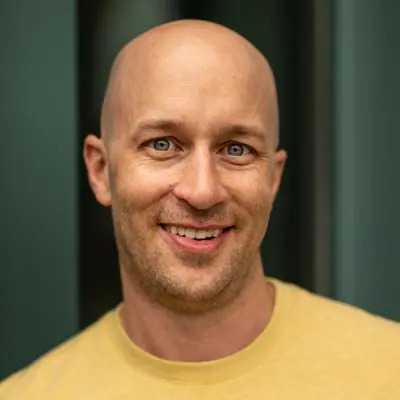 Thank you Justin for all the time you put into this each week. It is much appreciated here in Paris, France. Cheers, Malcolm. Results are on ultrasignup now. Joe Laue (22:49) and Angela Shartel (26:11) won the 100M (Joe’s time was 6th fastest ever, Angela’s was 2nd). It was a very hot year. Sarka Petrickova and Benoit Laval were the winners of the Barkley Fall Classic in 9:18:44 and 8:55:49 respectively. Meant to give runners a taste of the Barkley Marathons, the course was about 36 miles long with 11,000-12,000 feet of elevation gain and several miles of bushwhacking through briers. The heat index reached 98 degrees in the middle of the day. However, nearly half of the runners finished this year, as opposed to a 32% finisher rate in 2017. Wow, Michele is back! Good for her! Mark Hammond had a great run in muddy conditions at the well-organized and low key Stone Mill 50 in Maryland finishing in 7:15 for the win. Erin Hub was the top woman at Stone Mill in 9:04.